Sarina performs her alternative tribal fusion belly dance style at many venues in Eugene and sometimes Portland, Oregon. 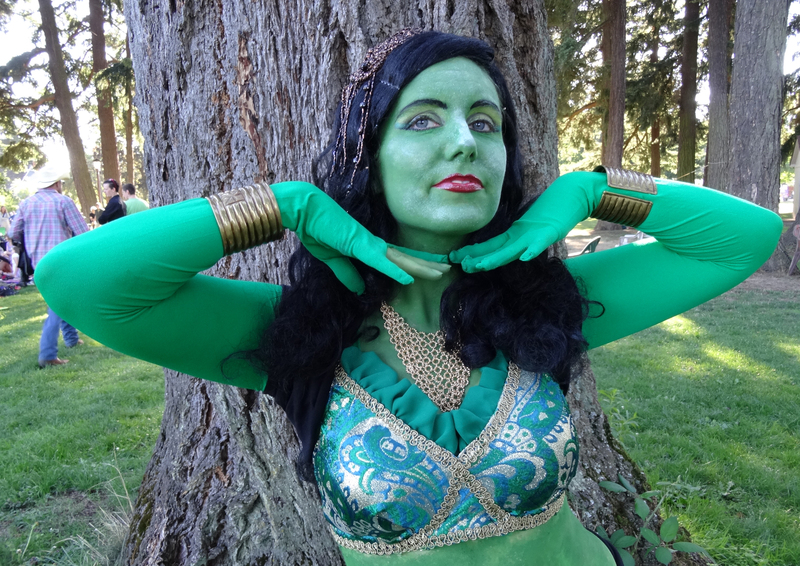 Local events she frequently is involved in are: Fusion Friendly Events (a showcase of alternative/fusion belly dance and other dance styles), MEDGE's February Alternative Night Show (Middle Eastern Dance Guild of Eugene) events, No Shame Eugene (a local variety show after the First Friday Art Walk in Eugene, charity events, festivals and opens for as Orion Slave Dancer for Trek Theatre's local plays of Star Trek episodes in the park. For examples of Sarina's range in style, check out her dance gallery with videos and photos of performances, featuring funky and elegant hand-crafted items she sewed herself. Whether she is steampunk belly dancing to neo-Victorian music, using her flamenco/burseque fusion fans with a 1920's flair, gypsy skirt twirling, clowning it up at Cirque du Eugene, or fusing break dance and belly dance to a Star Trek remixed music, she brings a lot of creativity and fun to the dance. at Cozmic Pizza, Eugene, OR. From the title, you might have guessed that this will be a science fiction themed event. We will have futuristic, robotic, post apocalyptic dance performances, funny skits, live science fiction themed music, sneak previews from Trek Theatre and readings from local authors. If interested in performing, the application form will be available on the Fusion Friendly website in a few weeks. This fun event will feature steampunk art, musical guests and performers and lots of fun costumes. In addition to performing and possibly reading, I will be selling my steampunk fashion: bloomers, fascinators, hats, and bustle skirts. Events are posted as they determined and frequently changes, so check back soon.